2017-2018 is officially “last season”. Here’s one last look before the draft. With the NBA draft coming up – after which the San Antonio Spurs will be once again be complimented on finding a good player that everyone else missed – it is time for my “end of the season” post. This season confirmed what Spurs fans hoped for – they can survive (and thrive!) post-Duncan, and they have a transcendent star. …the Spurs are the one team that can wonder “what might have been” if things had gone differently [i.e. had Zaza had not broken Kawhi] And that fact allows the Spurs to look back on the season with satisfaction. They can legitimately say they accomplished all they wanted to, did better than expected in the regular season with the second best record in the league, and went down fighting to a better opponent – but possibly “better” only because healthier. 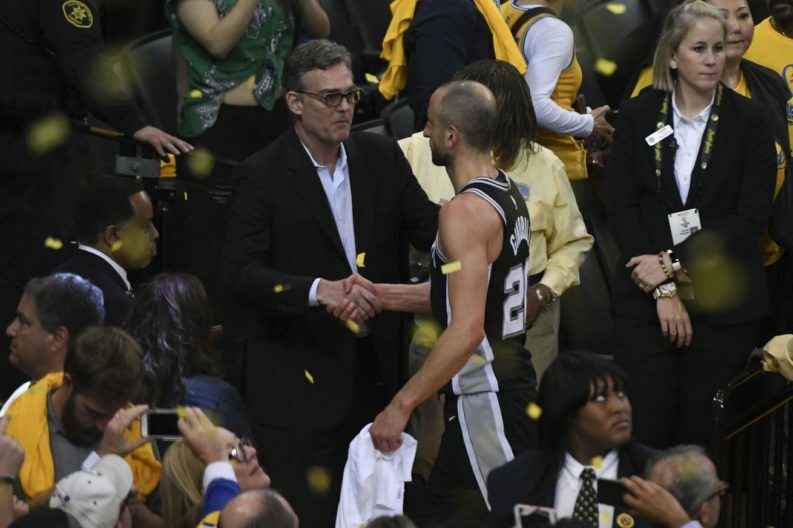 Unfortunately, while the Spurs entered the 2017-2018 season with hope, the drama with their “transcendent star” overshadowed almost everything that followed. Kawhi’s issues proved to be totally unlike the normal situation in which the injured player undergoes surgery and the team has a reasonable estimate on the player’s return. The Spurs, and Kawhi, instead suffered through the frustration of never quite knowing…. anything. Spurs fans, including me, never gave up hope for the Hail Mary pass – a Kawhi return. Even as the final weeks of the regular season wound down, all of us wondered whether the next Pounding the Rock headline would be “Kawhi Cleared for Full Contact Drills, Expected to Return Wednesday Night Against….” Of course, we never got to read that headline. As a result, despite the high hopes entering the season, and the Spurs overperforming for much of the year, 2017-2018 was an odd, and somewhat lost, year. And we will never know what might have been. Especially in light of the latest Kawhi reports, we may never even get to see “what might have been” one year removed. With 2017-2018 in the rearview mirror, we now begin the long wasteland of days, weeks and months with no NBA games at all. I will spend the dog days of summer thinking back on my favorite NBA memories. As is now a tradition, like “One Shining Moment” at the end of March Madness, I will end this season with a list of Favorite Memories. Some from the distant past, some from the recent present. Yep, those are my favorite things.